The irrepressible Campus Construction Update returns with a series of occasional reports on short-term facilities projects. Today: Bates’ entry into solar electricity production. “Renewable energy is a passion of mine,” Brent Feldman ’17 told Campus Construction Update soon after climbing down off the roof of the Bates Coastal Center, aka Shortridge, in Phippsburg. 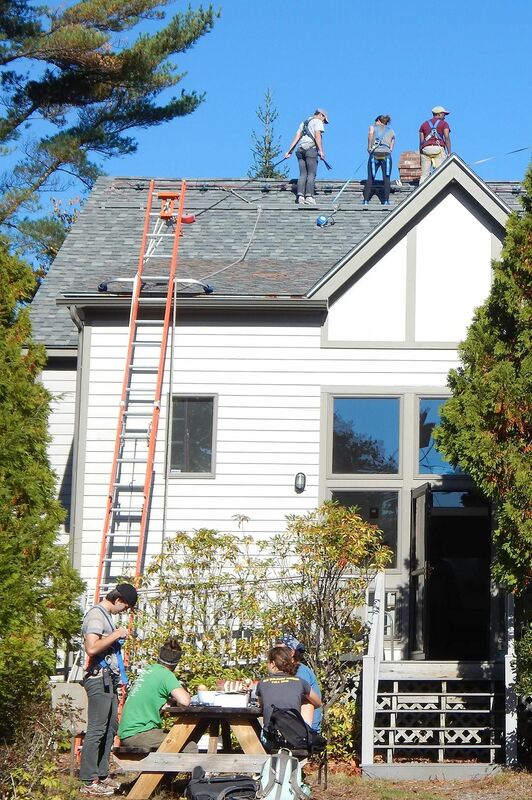 Feldman, who spent his summer as an intern for the solar industry’s national trade association, was now indulging that passion in a hands-on way as part of a Bates group helping to install a solar photovoltaic array — Bates’ first institutional PV installation — at the center on Oct. 19. Two technicians from the New England firm ReVision Energy led the installation of 12 PV modules at the center. Feldman and six other students spent the first day of their October recess three stories high, hooking up power cables and bolting down panels. During the summer, ReVision had done preliminary work requiring professional expertise — installing mounting rails for the panels and making electrical connections into the building. That set the stage for the Bates-ReVision collaboration. Here’s a video by Daniel Stames ’17 of the installation. 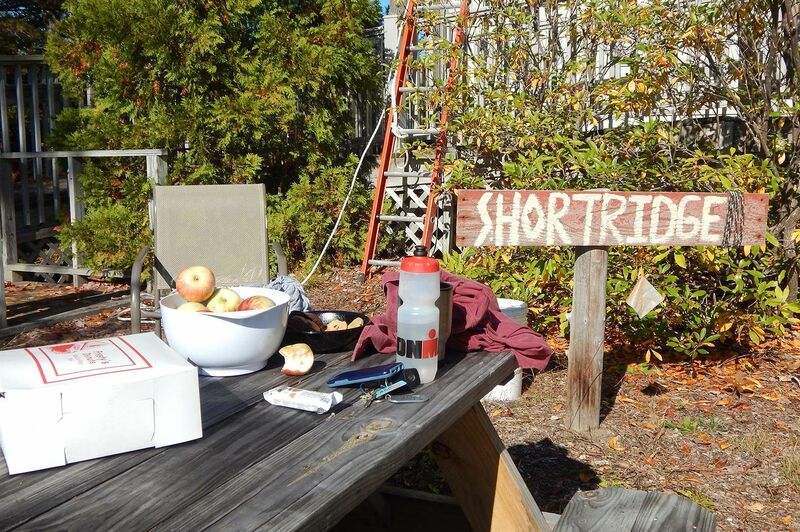 Oct. 19 was sunny, making the autumn foliage in Phippsburg a treat — and unseasonably warm, making the Shortridge rooftop a hot workplace. The students, all from the Northeast, worked with ReVision project manager Ashton Ireland in two shifts. Also on hand were Bates sustainability manager Tom Twist and Laura Sewall, director of the Bates–Morse Mountain Conservation Area, which administers the center. 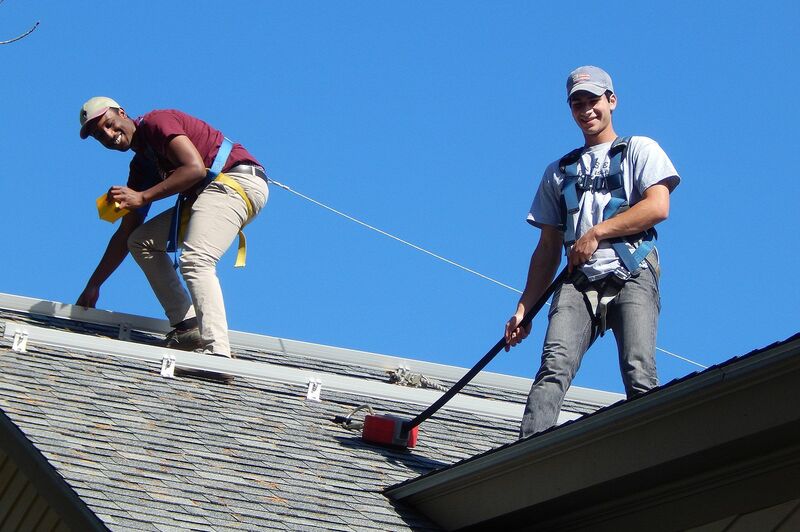 The first team to don safety harnesses and go to the roof comprised Feldman; his classmates Ahmed Sheikh of Lewiston and Danny Stames of Morrisville, Vt.; and Hannah Slattery ’18 of Gilford, N.H. Going up second, for the glamour job of mounting the solar panels themselves, were Sophia Thayer ’18 of West Boothbay Harbor, Maine; George Fiske ’19 of West Hartford, Conn.; and Katharine Gaillard ’19 of Exeter, N.H. While the second team stayed at ground level and steeled themselves for things to come with apples, Frosty’s doughnuts, and Bates cookies, the first team connected cables and used torque wrenches to bolt down power optimizers — computer gizmos that, like a good coach, enable each solar panel to give its personal best. 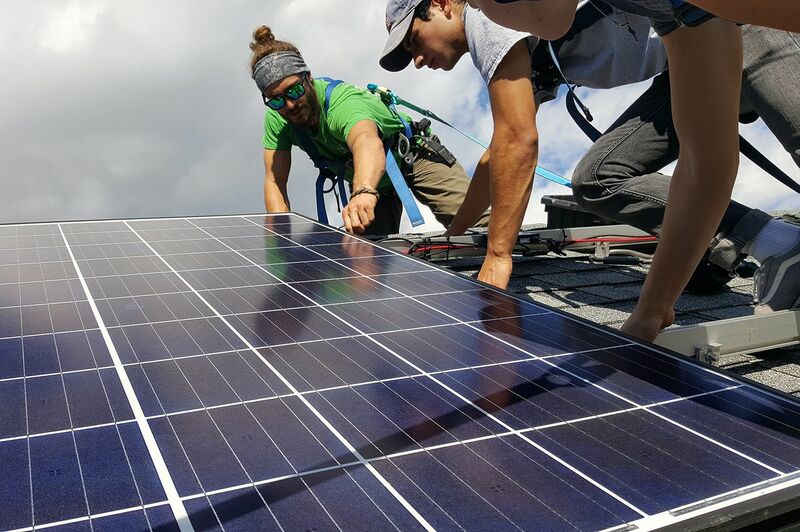 With Twist hopping up and down the ladder to take pictures, Ireland took the second shift up to place the panels, made by Canadian Solar. This was an all-hands effort, as Sheikh, Feldman, and Slattery pulled ropes to hoist the sled-like arrangement that carried each panel up the ladder. Stames, meanwhile, piloted a drone to photograph the proceedings. The roof pitch wasn’t extreme, but steep enough to keep Campus Construction Update on the ground. Ireland received each 48-pound panel at the top of the ladder — that is, for our height-averse readers, right at the edge of the roof — and carried it uphill to the rails, where he guided the Bates students in placing and securing it. The work went surprisingly fast. For Feldman, a double major in environmental studies and politics, the Shortridge adventure brought a needed dimension to his understanding of the renewable energy industry. As an intern for the Solar Energy Industries Association, Feldman had spent the summer in Washington, D.C., lobbying on Capitol Hill and researching solar policy and economics. To his sophisticated grasp of the policy side — did you know that solar installation costs have declined 72 percent in the last decade, and 10 percent in the last year? — Feldman wanted to add a nuts-and-bolts grasp of the actual work involved. The 3,000-watt array meets about half of the center’s electrical demand. ReVision designed the project to leave space for another dozen panels, so someday Shortridge may go 100 percent solar. Bates’ sustainability office and the Bates–Morse Mountain Conservation Area split the roughly $10,000 cost of the array. Halving Shortridge’s $1,200 annual electric bill will be very nice, but the real power of the project might be symbolic: demonstrating how easy it has become, both technically and financially, to go solar. And with more than 500 environmentally minded Bates students and faculty passing through Shortridge annually, said Sewall, this research and meeting facility isn’t a bad venue for sending a message about the urgency of embracing renewable energy. The Shortridge project is not only Bates’ debut as solar electricity producer, but also one of Maine’s rare instances of undertaking such a project as an educational encounter. 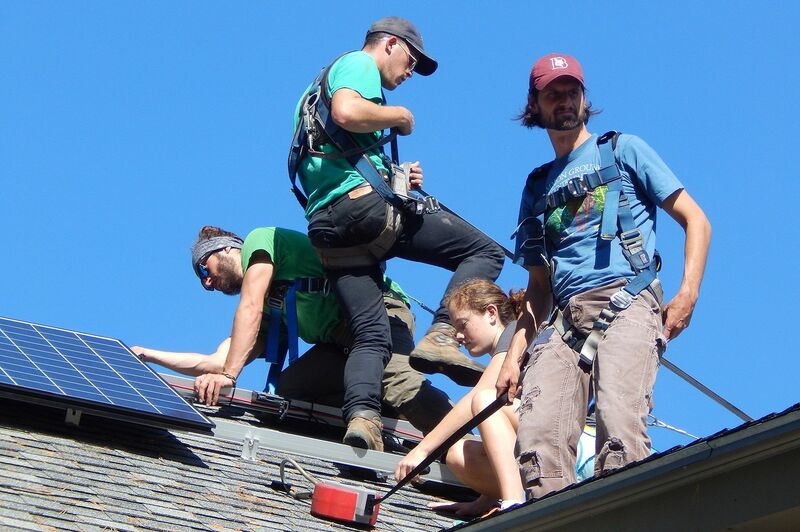 As chief sustainability officer at his previous workplace, the Chewonki Foundation, Twist asked ReVision to work with students in a solar installation on a dorm. He brought the firm back for Shortridge — and he and Sewall emphasized the value of the company’s willingness to bring students into the installation. Time is money, and ReVision’s educational commitment meant a longer site visit because of the need to instruct students and otherwise accommodate their participation. In the case of Shortridge, a normal morning’s work for the ReVision crew stretched well into afternoon. The timing of the project is fortuitous, as Mainers continue to deliberate the pros and cons of the state’s net-metering regulations — the obligation of electrical utilities to pay the standard rate per kilowatt-hour to small electricity producers whose surplus power feeds the grid. Net metering has made PV solar affordable for many homeowners and other small-scale operators. But detractors, including Maine Gov. 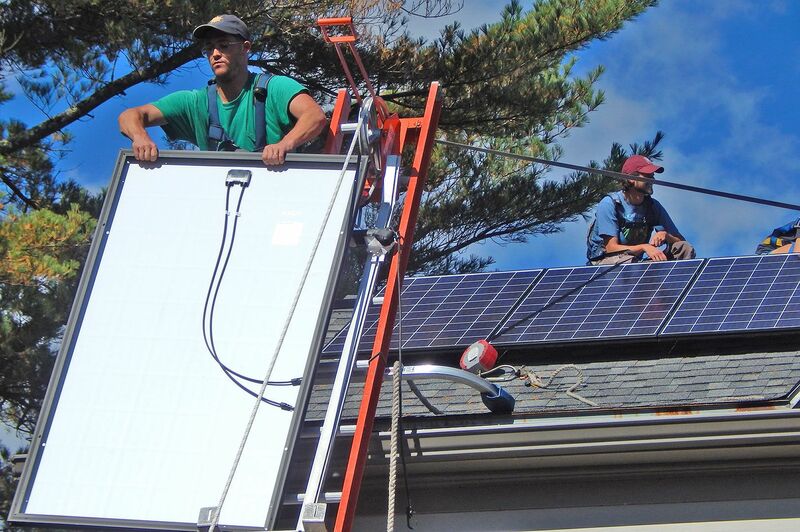 Paul LePage, see it as a giveaway to the solar industry, and seek to dismantle net metering. That could bear directly on the ability of an institution like Bates, which is just beginning a feasibility study of the topic, to meet its electrical need with solar. “If we wanted to someday try to cover a large percentage of our electrical load, we don’t have enough roof space on campus to have panels to produce all that power,” Twist explains. So the college would need to build a solar farm on open land somewhere. Can we talk? Campus Construction Update welcomes your questions and comments about current, past, future, and imaginary construction at Bates. Write to dhubley@bates.edu, putting “Campus Construction” or “How can we miss you when you won’t go away?” in the subject line. Or use the 21st-century commenting system below.